‘Um, it’s just flip-flops, papa! What’s so shocking?’ I asked, knowing fully-well what he meant. Each toe was wiggling cozy inside a differently coloured toe in the rainbow socks. In white flip-flops. Just for Rs. 50 from Lajpat Nagar. I was a new student in New Delhi and back home on my first vacation. And it showed. And for all 17 years that I was home, my parents made sure that the thin line between comfortable dressing and shabbiness was never crossed. Also, that we children looked as proper as the occasion demanded. 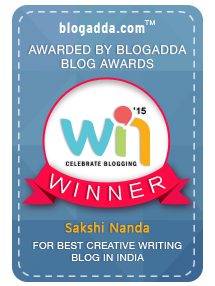 Awesome post Sakshi and as is the norm, I am going to paste this comment on the Parentous blog as well, but want you to know that I like commenting on this site to give you due credit to this post. Regarding the post itself, it made me feel extremely guilty as I have consciously unlearnt all that my father taught me in terms of wearing appropriate clothes for appropriate occasions. Blame it on my hostel life for 2 yrs, or laziness in maintaining my clothes or my IT Job which suddenly made Friday Dressing the norm throughout the week, but the kind of clothes and the ensembles that I wear nowadays make me cringe at the thought of it. Oh lord. While I had no intention of making you feel guilty about the comfortable choices you have made with regards your wardrobe, I am happy yo have set you thinking. Although, it's a free world and one can do as they please and wear as they deem fit. Convent school... huh... I know... Tip top, no jewels, nothng!!! But I loved those days.... Loved this!